The diagnosis and treatment of foreign bodies in the airway are a challenge for otolaryngologists. Despite improvements in medical care and public awareness, approximately 3000 deaths occur each year from foreign body aspiration, with most deaths occurring before hospital evaluation and treatment. A high index of suspicion is needed for foreign body aspiration to allow for prompt treatment and avoidance of complications. Until the late 1800s, airway foreign body removal was performed by bronchotomy. The first endoscopic removal of a foreign body occurred in 1897. Chevalier Jackson revolutionized endoscopic foreign body removal in the early 1900s with principles and techniques still followed today. The development of the rod-lens telescope in the 1970s and improvements in anesthetic techniques have made foreign body removal a much safer procedure. Most airway foreign body aspirations occur in children younger than 15 years; children aged 1-3 years are the most susceptible. Vegetable matter tends to be the most common airway foreign body; peanuts are the most common food item aspirated. The incidence of metallic foreign body aspirations, particularly of safety pins, has decreased in frequency secondary to the advent of disposable diapers. They lack molars for proper grinding of food. They tend to be running or playing at the time of aspiration. They tend to put objects in their mouth more frequently. They lack coordination of swallowing and glottic closure. After foreign body aspiration occurs, the foreign body can settle into 3 anatomic sites, the larynx, trachea, or bronchus. Of aspirated foreign bodies, 80-90% become lodged in the bronchi. In adults, bronchial foreign bodies tend to be lodged in the right main bronchus because of its lesser angle of convergence compared with the left bronchus and because of the location of the carina left of the midline. Several papers have demonstrated equal frequency of right and left bronchial foreign bodies in children. Larger objects tend to become lodged in the larynx or trachea. Clinical presentation depends on the location of the foreign body. A large foreign body lodged in the larynx or trachea can produce complete airway obstruction from either the dimensions of the object or the resulting edema. Laryngeal foreign bodies present with airway obstruction and hoarseness or aphonia. Tracheal foreign bodies present similarly to laryngeal foreign bodies but without hoarseness or aphonia. Tracheal foreign bodies can demonstrate wheezing similar to asthma. 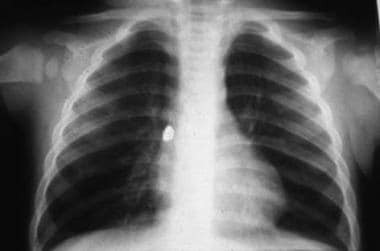 Bronchial foreign bodies typically present with cough, unilateral wheezing, and decreased breath sounds, but only 65% of patients present with this classic triad. Foreign body aspiration can mimic other respiratory problems, such as asthma. Foreign body aspiration differs in the presence of unilateral wheezing and decreased breath sounds. Perform surgical intervention with rigid bronchoscopy on patients who have a witnessed foreign body aspiration, those with radiographic evidence of an airway foreign body, and those with the previously described classic signs and symptoms of foreign body aspiration. The history and physical examination are the most important aspects in the decision for surgical intervention. A strong history of suspected foreign body aspiration prompts an endoscopic evaluation, even if the clinical findings are not as conclusive or are not present. Airway foreign bodies can become lodged in the larynx, trachea, and bronchus. The size and shape of the object determine the site of obstruction; large, round, or expandable objects produce complete obstruction, and irregularly shaped objects allow air passage around the object, resulting in partial obstruction. No contraindications exist to the removal of an airway foreign body from a child. If necessary, health problems can be optimized before surgical intervention. However, even children who are at high risk due to health reasons still need surgical intervention to remove the foreign body. Cheng J, Liu B, Farjat AE, Routh J. The public health resource utilization impact of airway foreign bodies in children. Int J Pediatr Otorhinolaryngol. 2017 May. 96:68-71. [Medline]. Bloom DC, Christenson TE, Manning SC, et al. Plastic laryngeal foreign bodies in chidren: A diagnostic challenge. Int J Pediatr Otorhinolaryngol. 2005. 69:657-662. Brown JC, Chapman T, Klein EJ, Chisholm SL, Phillips GS, Osincup D, et al. The utility of adding expiratory or decubitus chest radiographs to the radiographic evaluation of suspected pediatric airway foreign bodies. Ann Emerg Med. 2013 Jan. 61(1):19-26. [Medline]. Behera G, Tripathy N, Maru YK, et al. Role of virtual bronchoscopy in children with a vegetable foreign body in the tracheobronchial tree. J Laryngol Otol. 2014 Dec. 128(12):1078-83. [Medline]. Holinger LD. Management of sharp and penetrating foreign bodies of the upper aerodigestive tract. Ann Otol Rhinol Laryngol. 1990 Sep. 99(9 Pt 1):684-8. [Medline]. Kinoshita K, Azuhata T, Kawano D, et al. Relationships between pre-hospital characteristics and outcome in victims of foreign body airway obstruction during meals. Resuscitation. 2015 Mar. 88:63-7. [Medline]. Kadmon G, Stern Y, Bron-Harlev E, Nahum E, Battat E, Schonfeld T. Computerized scoring system for the diagnosis of foreign body aspiration in children. Ann Otol Rhinol Laryngol. 2008 Nov. 117(11):839-43. [Medline]. Black RE, Johnson DG, Matlak ME. Bronchoscopic removal of aspirated foreign bodies in children. J Pediatr Surg. 1994 May. 29(5):682-4. [Medline]. Chatterji S, Chatterji P. The management of foreign bodies in air passages. Anaesthesia. 1972 Oct. 27(4):390-5. [Medline]. Cohen S, Avital A, Godfrey S, Gross M, Kerem E, Springer C. Suspected foreign body inhalation in children: what are the indications for bronchoscopy?. J Pediatr. 2009 Aug. 155(2):276-80. [Medline]. Deutsch ES, Dixit D, Curry J, et al. Management of aerodigestive tract foreign bodies: innovative teaching concepts. Ann Otol Rhinol Laryngol. 2007 May. 116(5):319-23. [Medline]. Esclamado RM, Richardson MA. Laryngotracheal foreign bodies in children. A comparison with bronchial foreign bodies. Am J Dis Child. 1987 Mar. 141(3):259-62. [Medline]. Holinger PH. Foreign bodies of the air and food passages. Trans Am Acad Ophthalmol Otolaryngol. 1966. Inglis AF Jr, Wagner DV. Lower complication rates associated with bronchial foreign bodies over the last 20 years. Ann Otol Rhinol Laryngol. 1992 Jan. 101(1):61-6. [Medline]. McGuirt WF, Holmes KD, Feehs R, Browne JD. Tracheobronchial foreign bodies. Laryngoscope. 1988 Jun. 98(6 Pt 1):615-8. [Medline]. Murray AD, Mahoney EM, Holinger LD. Foreign bodies of the airway and esophagus. Cummings, et al. (eds). Otolaryngology-Head and Neck Surgery. (ed 3). St. Louis, MO: 1998. Vol 5: p 377. Murray AD, Walner DL. Methods in instrumentation for removal of airway foreign bodies. Operative Techniques in Otolaryngology-Head and Neck Surgery. 2002 March. 0(1):2-5. Ritter F. Questionable methods of foreign body treatment. Ann Otol Rhinol Laryngol. 1974;83:729. Shah RK, Patel A, Lander L, Choi SS. Management of foreign bodies obstructing the airway in children. Arch Otolaryngol Head Neck Surg. 2010 Apr. 136(4):373-9. [Medline]. Swanson KL, Prakash UB, Midthun DE, et al. Flexible bronchoscopic management of airway foreign bodies in children. Chest. 2002 May. 121(5):1695-700. [Medline].